My son has a learning disability. It is unbelievably difficult for me to write those words, let alone read them out loud to myself. It is even harder for me to hear “Your son has a learning disorder.” Or “Your son needs to be moved into the Special Education department.” But today I have had to write, read and hear all of those things. After a year of testing, experimenting and yes, an awful lot of crying (hey, I am a mom after all), everyone is on the same page. My darling, bright, gifted, funny, talented, willful, sometimes lazy, extremely disorganized boy has dysgraphia. Or as the education system insists upon calling it a “Learning Disability of Written Expression”. With 9 days left in 5th grade, he finally has an IEP in place and plans for special education assistance for the remainder of this school year (9 whole days) and all of next year. Because somehow, we have to get all of his accommodations perfected and in place before he enters Middle School. Where things will get seriously hairy … or so I am told. Part of me is so grateful that they finally agree that it can not be fixed by any amount of practicing. It is neurological and although we can make it manageable, administering Writing Without Tears ad nauseam isn’t going to make the act of writing any more automatic. For my boy, handwriting anything will always be akin to writing in Chinese … backwards … for the rest of us. Part of me is a bit miffed that it has taken 3 years for the school system to acknowledge it is a problem worth investigating. Part of me is seriously P.O.’d at myself for not homeschooling him. I don’t want him to have a Learning Disability (LD). I want school to be easy for him. I want it to be as fun as it possibly can be for a boy who would really rather create with his Lego’s, or create movies with his friends to be posted secretly on YouTube. (Don’t worry, he is still in the Super Heroes movie stage. When puberty starts to hit I will start worrying about the movies …) I want life to be easy for him. He’s handsome, but shy and a little awkward. He doesn’t make friends easily, but those he makes, he is very loyal to. His trust is not easily earned, but once you have it, it is also not easily lost. He’s the freakin’ center of my universe, which I know is not where he is supposed to be, and I try so hard not to let him know that he is. I hurt for him, because I wanted life to be easier for him than it ever was for me. I’m trying really hard to trust that this is God’s way of building strength in my son. I am trying to believe that the skills he learns now, as he has to work harder than any of his classmates, will serve him well when he is an adult. I didn’t learn that hard work equals success when I was in school. It came too easily for me. I didn’t learn to study until I was in college because I could grasp ideas really easily and remembered most of what I needed to know. It wasn’t until much later, when I was in the workplace and things were not going so well that I figured out how to buckle down and focus. So maybe, just maybe, he will be better off in the long run? I am trying to find hope in that. Mostly, I am just hoping that he will know that he is loved and perfect and wonderful and necessary and vital and SMART and capable and oh, so, so much more. I hope that he will learn not to define himself by this label, that he will learn not to limit himself, when this is one tiny little piece of his puzzle. He is more than his disorder and I pray that I am mother enough to help him believe that. You are mother enough to let him know that he is not his disorder. I am sure of it. I have dyslexia and dysgraphia as does my oldest son. We just found out that my youngest also has dysgraphia. 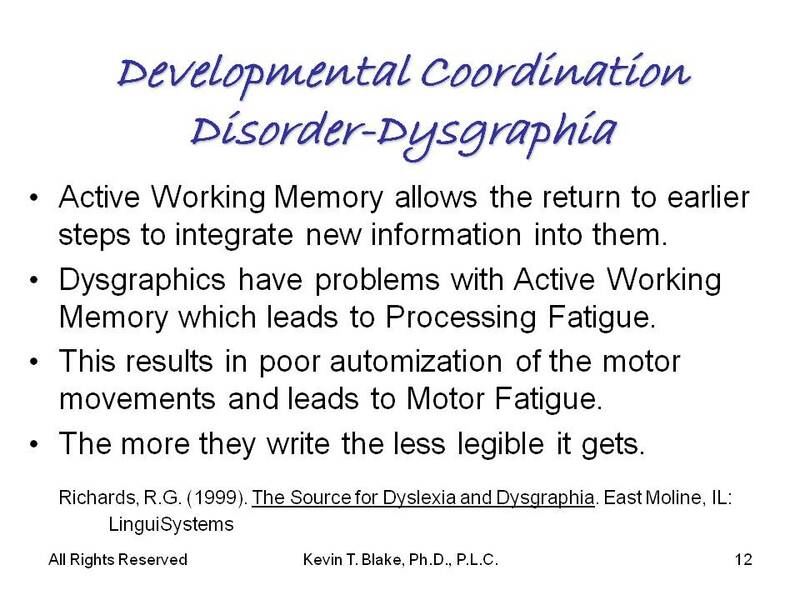 There are so many awesome things out there now for kiddos and adults with dysgraphia. At least now, you know how to work with how his mind thinks. This is how I explained it to my kiddos-it is not a learning disorder. It is just a different way of looking at things. Since I have it also, I am sure of this. It can be difficult at times, but it also gives us a power to see things in a different way. All the best to you and your little (I know he is in 6th grade..smile) man.